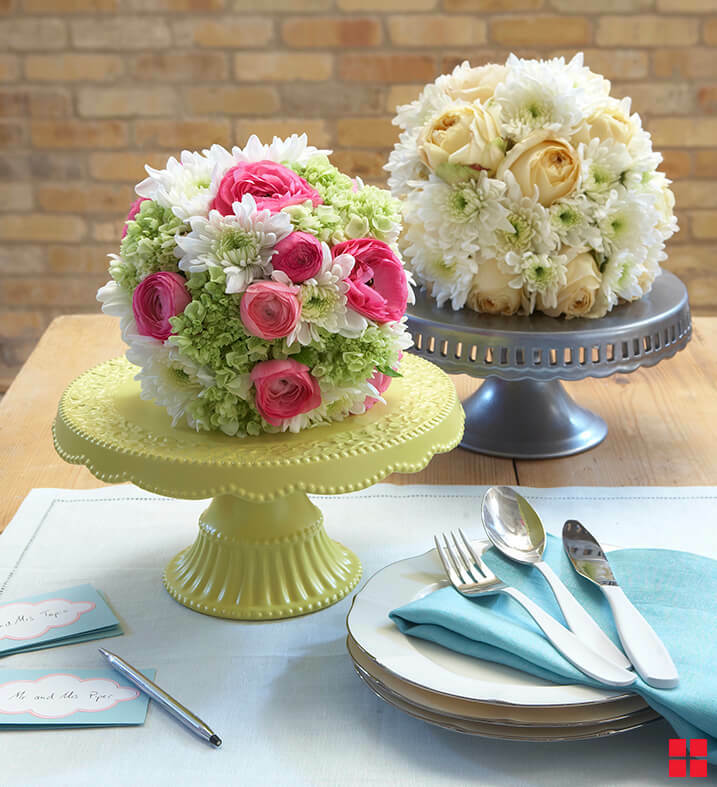 Cake stand centerpieces like this are not only a gorgeous idea for weddings, they are a really lovely idea for bridal shower centerpieces or for engagement parties as well. Because the cake stand adds height to the centerpiece and gives it form and structure, providing a framework for the centerpiece design, it a really easy way to create your own pretty impressive looking DIY centerpieces. 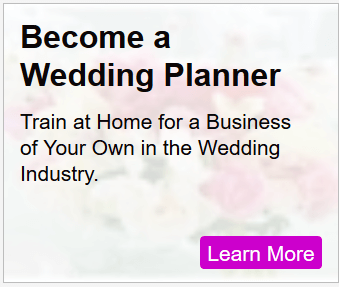 In fact, most of your guests will never guess that you did it yourself. The cake stand wedding centerpieces in the photo above are so pretty, yet they were created very simply by combining pomander flower arrangements which were then simply placed on cake stands. By the way, in case you’re not familiar with the terminology, a pomander is a floral arrangement shaped like a ball. Sometimes these types of floral arrangements are also called “Tussie Mussies”. They date back to the Victorian era, where they were referred to as “kissing balls”. The Victorians would sometimes hang them over doorways (kind of the same idea as Mistletoe, only kissing balls were used all year long), or they would suspend them from the ceiling when a young couple was courting. When the couple found themselves under a kissing ball, you guessed it, they were supposed to kiss. Pomanders are sometimes carried by brides or bridesmaids as a wedding bouquet alternative (very popular for flower girls too), but they are very frequently incorporated into wedding decor. The pomander flower arrangements in this cake stand centerpiece design are displayed on inexpensive cake stands found at flea markets, thrift stores or garage sales for cheap. When you need a cake stand for every table at your reception, cheap is key! But they won’t look cheap by the time you are done. Time for a little Wedding DIY…. Collect up the number of cake stands you need so that you’ll have one for a centerpiece on each of your reception tables (remember, hit garages sales, thrift stores, and flea markets. Then you’re going to totally transform those cake stands and coordinate them to your color theme. Spray each cake stand with Rustoleum paint, a spray paint used for crafts and other household projects (like spray painting furniture, etc.). You can find Rustoleum spray paint almost anywhere paint is sold. Its super easy to use, just point and spray! You can spray every cake stand for each table the same color, or you can go for more of an eclectic look by using different colors. Another option is to pick two or three colors, or one main color an an accent color and just stick to those colors for your motif. Or maybe combine a main color, and a metallic color. For instance, spray some of your cake stands in blue, and others in silver. Combining a main color with a complimentary metallic (either gold, silver, or bronze) can be very elegant. Note: You can either make your own pomanders/ tussie mussies, or you can have a florist create them for you. You can occasionally find the pre-made in craft stores, home decor stores, or even dollar stores, but finding them in the size and color you want will be a bit of a long shot, so have a back up plan. Here’s how to get this look for your cake stand wedding centerpieces. Always work in a well ventilated area and cover nearby items with drop cloths to protect from overspray. Wipe down the cake plates using a lint free rag. Shake your can of Ultra Cover 2X Satin spray paint (we used Satin Summer Squash) for 1 minute after the ball begins to rattle. Hold the paint can 10-12” from the cake plate and spray in a steady back-and-forth motion, slightly overlapping each stroke. Apply 2 or more light coats a few minutes apart. For best results, apply multiple light coats instead of one heavy coat. For the metallic cake plate, follow these same steps using Universal Metallic spray paint in Titanium Silver. FINISH: Allow the cake plates to dry for at least two hours before assembling the centerpieces. Easy, peasy! Now you’ve got stunning custom cakes stands (that you paid next to nothing for) to make ever more stunning cake stand centerpieces for your wedding reception tables. 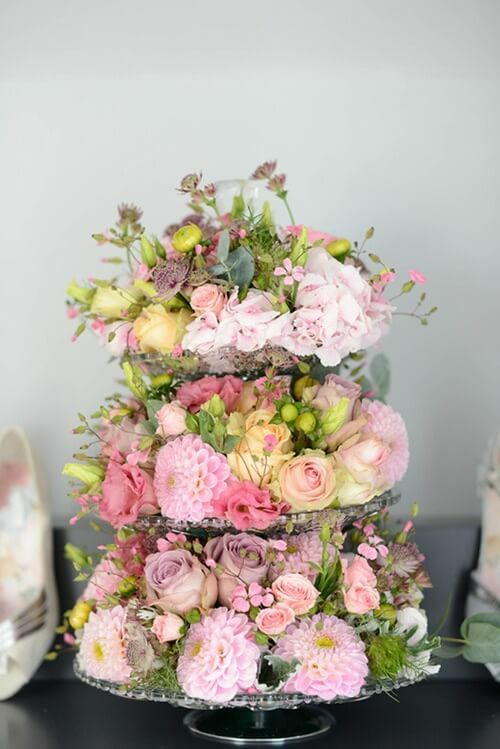 The design above was for a one-tier or one-level centerpiece, but for a variation on the idea, you can use tiered cake stands for taller, more elaborate looking centerpieces.This can give you the look of a floral covered tiered wedding cake, which is really pretty. 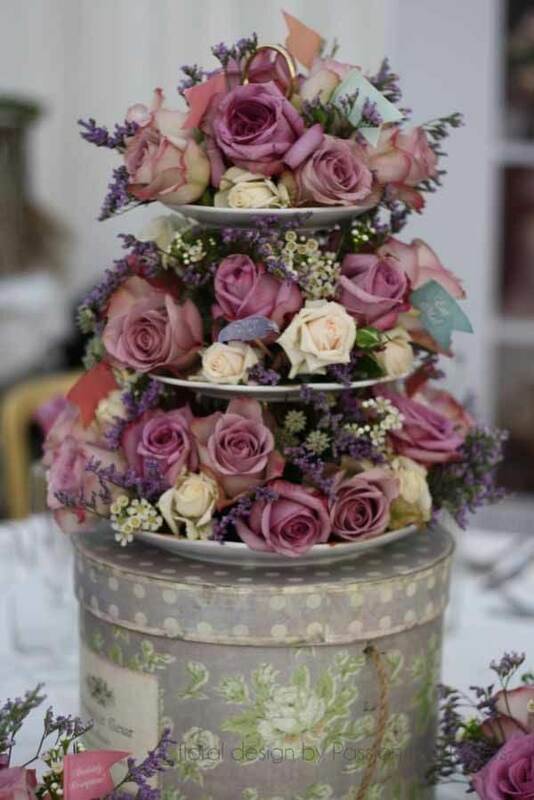 Check out these really pretty examples of tiered cake stands that have been covered with flowers to take on the look of a wedding cake. 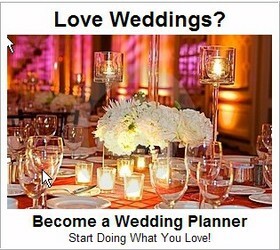 If you like this idea, there are several possible ways of incorporating it into your wedding decor. More ideas for how you can incorporate these cake stand designs into your wedding decor. As already discussed, place flower arrangements on cake stands and use them at the center of each reception table as your table centerpieces. 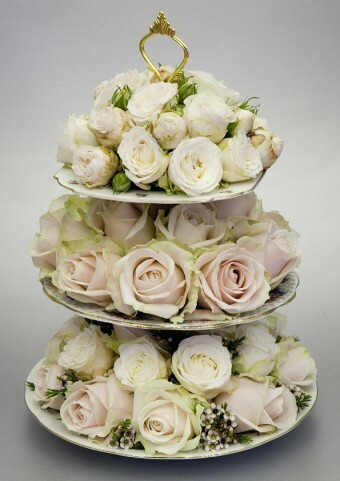 At a smaller wedding, a flower arrangements on cake stands make a quaint wedding cake alternative. 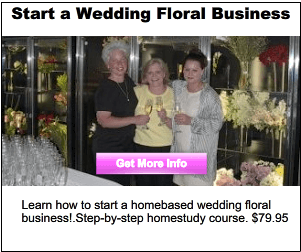 Its also a terrific way to save money – it will cost much less than a real wedding cake, especially if you use realistic looking silk flowers. Its different, memorable, and very pretty which means it will make a real impression on guests and have them talking about it. 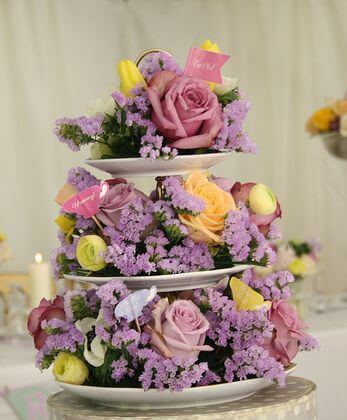 Simply order a much less expensive slab cake to cut and serve to guests, and let the decorated cake stand be the star. If you opt for an actual wedding cake, and already have the centerpieces for your tables under control, but would still like to incorporate this idea into your wedding decor, consider using flower arrangements on cake stands at the buffet table if you’re having one, or the dessert table. Its a relatively simple way to give the tables a gorgeous dressed up look, which giving a lot of visual effect.